The Indiana State University Board of Trustees gave President Dan Bradley high marks again this year following his annual performance review, which concluded Thursday. 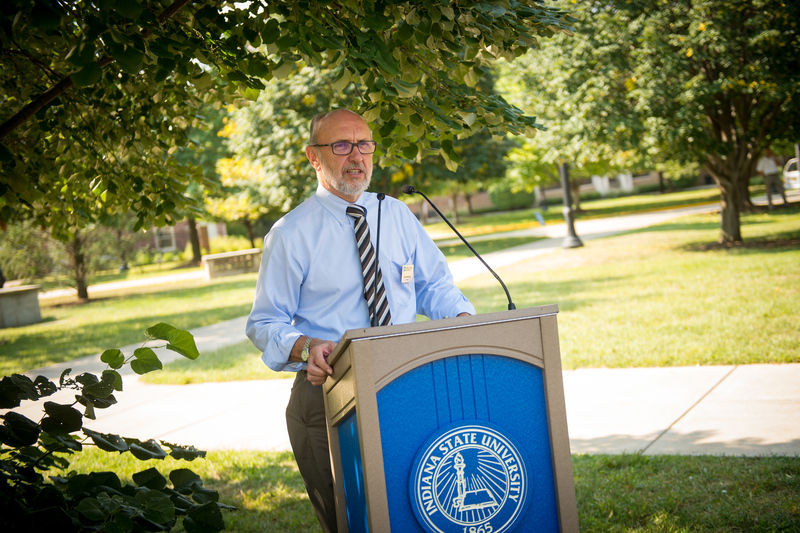 "This has been an incredible year for Indiana State -- historic enrollments, the kickoff of the Sesquicentennial Era, the completion of the Normal Hall renovation and the continued upgrading of our student housing with the new downtown housing project at 500 Wabash and the renovation of Blumberg Hall," said Dave Campbell, chair of the board of trustees. "I am incredibly proud of everything that is being accomplished under the leadership of Dan Bradley, and the board is very pleased with his performance." All university employees are evaluated annually and set supervisor-approved performance goals for the coming year. Among Bradley's goals this year are to continue to increase enrollment, improve student retention and on-time graduation; keep tuition and fee increases at or below inflation; increase state and capital appropriations; implement a new strategic plan; provide leadership for the remodel of Cromwell Hall, Sycamore Dining, the Health and Human Services building and Hulman Center; and increase private giving to Indiana State. "It is critically important that the university maintain this momentum as it kicks off a new strategic plan and works to continue to grow enrollments and improve retention and graduation rates," Campbell said. "The president will also be leading the effort to garner additional state support during the biennial budget process and working to improve private giving to the university. The continued implementation of the master plan, with several major capital projects and improvements underway or in the pipeline, will add to a very busy year." Before convening the open-session meeting, the trustees ceremonially broke ground on the Health and Human Services facility renovation and expansion project, the largest state-funded project in the university's history. The Indiana State Budget Committee approved in March the $64 million expenditure to modernize and expand the former Arena Building, which was built in 1961 with an addition in 1986. Later during the meeting, the trustees approved the Series R Bond Resolution, would includes the issuance of new debt and refunding all outstanding principal of Series M and Series O Bonds, maturing after Oct. 1, that were issued June 29, 2007, and April 7, 2011, respectively. Total proceeds from the new issuance and refunding will not exceed $98.5 million. Construction on the Health and Human Services facility project began in July and includes major upgrades to improve temperature control and air quality in the building as well as technology improvements. Interior space will be reconfigured to enable academic programs to function more efficiently. The project also includes an 87,000-square-foot expansion to house new academic programs and accommodate existing programs now housed elsewhere on the Indiana State campus. Ratio Architects Inc. of Indianapolis is the architect for the project, which is scheduled for completion in early 2019. The board also approved the biennial state budget request for 2017-19, to be submitted to the Indiana Commission for Higher Education and the State Budget Agency. The request includes $15 million for the special repair and rehabilitation of the Fine Arts and Commerce Building and line items for Degree Link ($457,600), the nursing program ($209,100) and the Indiana Principal Leadership Institute ($615,000). • Approved the transfer of the ICON building, located at 1 Sycamore St. and formerly known as the American Can Company, to the City of Terre Haute Redevelopment Commission for future development. • Approved a request to the Indiana Commission for Higher Education, the State Budget Committee, the State Budget Agency and the Indiana governor to authorize projects totaling $1,383,082 from Repair and Rehabilitation appropriation. The projects include exterior lighting improvements, masonry restoration and asbestos abatement. • Reactivated the specialization of Counselor Education to the existing Doctorate in Guidance and Psychological Services in the Bayh College of Education. • Approved the new program of Middle School Science Minor, effective fall 2017. • Approved all program fees to be assigned to courses as needed, effective with fall 2016 fee assessments, to ensure that all per semester program fees are appropriately assessed. https://photos.smugmug.com/Other/Media-Services/Submitted-Photos/Staff-Uploads/i-kP95MbV/0/O/CHHS%20renderings%20Aug%2016.jpg -- An artist's rendering depicts the Health and Human Services facility project from Third and Chestnut streets, looking northeast. 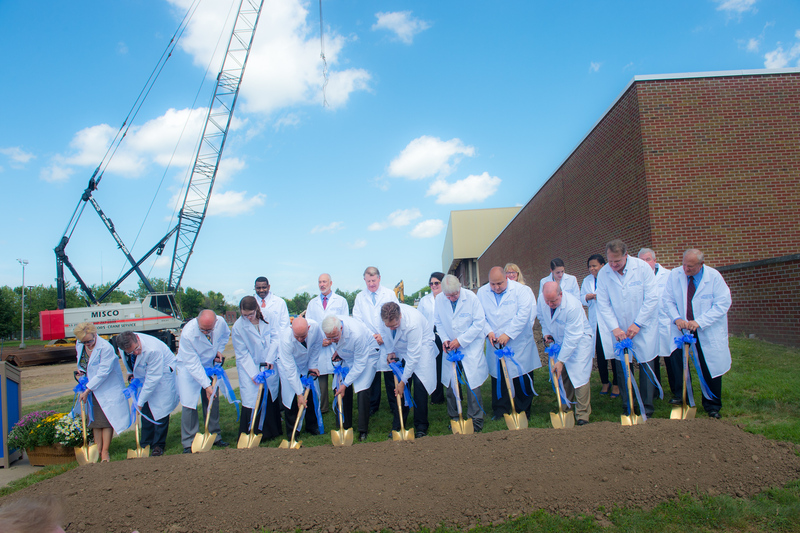 https://photos.smugmug.com/Events/Events-by-Year/2016/HHS-Ground-Breaking-2016/n-Lj5VzW/i-LDnNXng/0/X3/i-LDnNXng-X3.jpg -- University officials break ground at the Health and Human Services facility project Thursday. Before convening the open-session meeting, the trustees ceremonially broke ground on the Health and Human Services facility renovation and expansion project, the largest state-funded project in the university's history.